An 8000 square meter tent surface is situated close to Jamnagar, where our first mobile prefab concrete tower factory emerged. Arranged in a figure eight, this double tent measures 50 meters in diameter through the main section and is 36 meters high. WW-53 towers are produced here in 18 segments with a 5.50 m base diameter and a tower top diameter of 1.80 m.
Our engineers have been trained at the production site and at various construction sites to gain experience in producing and mounting prefab towers. The central point is a Liebherr pivot tower crane. It is used to distribute the concrete in the production area. A mobile concrete mixer is set up outside the tent. The mixer is also be used to provide concrete for the foundations. This way, a uniform quality of concrete for the foundations can be assured. Wind World (India) Ltd. has three Concrete Tower Factories (CTFs) at Gujarat and Karnataka. The fourth CTF in Rajasthan is under construction. Towers are important because of their load-bearing capability to support the turbine, which weighs close to 400 MT, and also because they bear the onslaught of winds, rain, erosion and other naturally occurring hazards. The load-dynamic design of the materials and structure used in our towers, provides the best conditions for transport, installation and use. Over and above binding national and international norms e.g. DIN and Eurocode, we have set our own standards which surpass these quality and safety norms. Virtual 3D models of the tower designs are produced during the development phase, using the Finite Element Method (FEM). All possible stress factors on the wind turbine are then simulated on the model. Accurate predictions concerning tower stability and service life are not left to chance before building a prototype. We continuously evaluate additional measurements on existing turbines, providing further verification of the calculated data. Our calculations are confirmed by results produced by specially commissioned certification bodies, research institutes and engineering firms. Aesthetic aspects are also a decisive factor during tower development, which is obvious in the elegant design of the finished product. The streamlined gradually tapered design, offers a visibly sophisticated ergonomic concept. In addition, there is also an ice machine at the production plant. At high temperatures, it produces over 120 tons of ice per day to cool down the concrete. Water for the ice maker is cleaned in one of our own water treatment plants. Tubular steel towers are manufactured in several individual tower sections, connected using stress-reducing L-flanges. Unlike conventional flange joints, the welding seam of the L-flange is outside the stress zone. Due to their relatively small circumference, shorter tubular steel towers are mounted on the foundation using a foundation basket. This consists of a double-rowed circular array of threaded steel bolts. A retainer ring, fitted to the tower flange dimensions, is used to hold the individual bolts in position. When the foundation is completed, the lower tower section is placed on the bolts protruding out of the concrete surface and then bolted with nuts and washers. For taller steel towers, a specially developed foundation connection system is used. A cylindrical structural element is set on the blinding layer, propped up to the correct height and precisely aligned with adjusting bolts. Once the foundation is completed, the tower is flanged together with the foundation section. Like all other components, tubular steel towers are subject to strict quality standards. Quality assurance begins in the design development stages, to ensure that the prototype meets all requirements before going into serial production. 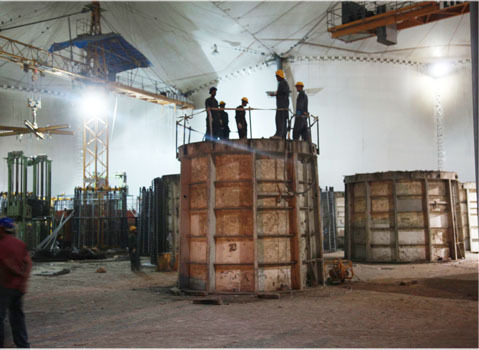 Wind World (India) Ltd.'s precast concrete towers are made using specially developed pre-stressed steel reinforcement. The individual tower sections and foundation are fastened together to form an inseparable unit with stay cables running through jacket tubes in the core of the concrete tower wall. The tower sections themselves are manufactured entirely in the pre-casting plant. Specially constructed steel moulds assure manufacturing precision for each individual concrete section. This manufacturing process minimizes dimensional tolerances, which assures a high degree of fitting accuracy. Here again, our quality assurance department carries out strict inspections. Detailed procedural and work instructions are available for each manufacturing sector. This ensures that each individual manufacturing stage as well as the materials used can be completely retraced.